Details of new events are still coming in and may change and every effort has been made to produce correct information, dates and times at the time of going to press. However, unforeseen circumstances may occur which are beyond our control. The Hastings Week Committee cannot be held responsible for such changes which are in the hand of individuals and groups/associations. There will be something for everyone and for all ages. Don't miss it! The 948th Anniversary of the Battle of Hastings. We bring you a festival of Hastings TODAY. Formerly The Fishermen's Church, now exhibiting many fishing artefacts of yesteryear, the centrepiece of which is "The Enterprise", one of the last Hastings' Sailing Luggers. Entry Free. Donations to Fishermen's Museum welcome. Hastings' and St Leonards’ finest restaurants are celebrating Hastings Week by taking a favourite local snack and putting their own spin on it. Pier Nine at Zanzibar Hotel, Pomegranate in the Old Town and St Clement’s in St Leonards will pay homage to Hastings’ famous Fisherman’s Roll, made popular by Tush and Pat Hamilton on Rock-A-Nore Road. On Saturday 11 October the restaurants will unveil their unique interpretations of the humble fish in a bun. The displays cover key moments in the town's history from prehistoric and Roman settlers through the Middle Ages and the role of the Cinque ports to the rise of the Victorian resort and wartime Hastings. The building is fully accessible, and contains a wealth of historic exhibits, interactive models and reconstructions. This charitable trust independent Museum intrigues visitors with stories from seafaring history. Amazing artefacts from local shipwrecks, films of excavations and interactive touch-screen technology all add to the experience. Exhibits from the Cretaceous period also introduce local dinosaur history. A nautical gift shop with profits paying for upkeep of Museum. Trains run daily weather permitting. AFRIKÀBA FESTIVAL, two weeks of great live events starting Saturday 4 October with Afro Cuban Band Grupo Lokito @ Stade Saturdays. Experience HKBFiNN’s newest work, AMPLiFiER a Spoken Word Opera, take part in the African / Latin Dance Workshop then head to the Stade to enjoy Afro Cuban band Grupo Lokito’s joyous blend of Kinshasa and Havana Salsa, join the Debate with renowned speakers Professors Gus John and Ted Cantle, help create Adventure Stories with mystical creatures @ Bohemia Walled Garden and Samba Reggae Style Adventures @ Hastings Museum & Art Gallery, catch the film screening of Nairobi Half Life @ Electric Palace Cinema and the finale on Sunday 12 October at the White rock Theatre features the mesmerising, award winning Dobet Gnahoré, an event for the entire family with face painting and Afro-Caribbean food for sale……. Whatever you do….. don’t miss out on this great line up……. enjoyment guaranteed! SALVATION ARMY CHARITY SHOP, OLD LONDON ROAD, ORE.
Open 11am - 4pm Thursday to Sunday. 1066 and the Bayeux Tapestry Exhibition, a chance to study the detail of the famous tapestry and find out about Anglo Saxon Sussex. Free admission but donation to OHPS welcome. Circle Dancing It’s easy, come and join us! Tuesday Oct 14th 10.00‐4.00 pm. Open day for Knit & Craft - The choice is yours! Bring your hobby to work on and/or your finished items to display. Wednesday Oct 15th. 10.00‐4.00 pm. 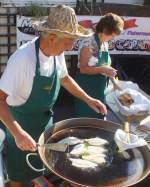 David Embry’s Art Day – A chance to practice or learn with an expert, materials available. Thursday Oct 16th. 10.45‐12.15 pm. Circle Dancing It’s still easy & enjoyable. Friday Oct 17th. 10.00‐12.00 noon. Poetry - Share your favourites or other short passages that are meaningful to you. Coffee Morning – proceeds to charity. There will be a display of Art Work and Photographs during the week. Walk starts from the top of the West Hill Lift. There is no charge for these walks but donations are appreciated. 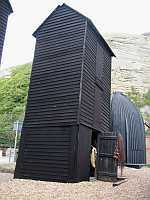 A fascinating tour of Hastings Old Town lasting about 90 minutes. proceeds gently downhill but there are steps. An OHPS event. Illustrated Guided Walk discovering the significant role public entertainment has played in the development of our seaside resort. Adult £6.00, Accompanied Child £3.50, payable at the. start, no reservations necessary. Route wheelchair accessible. Describing strange close encounters with the paranormal at a variety of town centre locations. Dare you join us? no reservations necessary. Route wheelchair accessible. A trail of discovery through concealed byways, some little known and rarely explored, featuring obscured and obscure evidence of bygone Old Town life. Route includes inclines and stairs. The actual location of the famous battlefield has now been challenged! This illustrated Guided Walk takes you to the alternative site, vividly describing the context and the course of the battle. and gruesome: local history featuring true tales of terror from. Old Town's less illustrious, past. Definitely not for the squeamish' May not be suitable for some: children- Route wheelchair accessible. You would expect this historic town to be haunted and it does not disappoint. Hear of local experiences of phantoms and poltergeists in the context of the elusive spirit world. Route wheelchair accessible. This comprehensive illustrated Guided Walk traces the area's development from Regency times through the Victorian era to the end of the last century. Route wheelchair accessible. Themed Walks Conducted by Clive Richardson. An atmospheric and entertaining guided walk of approx 1 hour 20 mins around the Old Town and fishing quarter, recounting true stories of smuggling in Hastings in the 18th and early 19th Centuries and the involvement of local people. A fascinating ‘war time’ guided walk of approx 1 hour, taking in most of the Hastings TV film locations used for this popular TV series. An interesting and unusual guided walking tour of hidden narrow footpaths, flights of steps and nooks & crannies, many with a tale to tell. The tour lastings approx 1 hour 20 mins involves some steps and steep inclines and will include amusing factual and historical anecdotes. Muster at 9.20 am outside BHS. March off at 9.30am to Town Hall. Flat 1, Kent Lodge, 2 St. Matthews Road, St. Leonards-on-Sea. Hastings & St Leonards Association National Trust. at The Arthur Easton Centre, St Michaels Hospice. Opera South East Presents RAGTIME, "JELLY-ROLL" & ALL THAT JAZZ’, Kenneth Roberts talks about and plays the music of the great ragtime and jazz pianists in an exploration of the roots of the first truly American music from its bawdy low-life beginnings to its finest hour in the 1930's & 40's. From the early beginnings in barrelhouses and brothels to the sophistication of Broadway, we take a journey through the music of Scott Joplin, 'Jelly-Roll' Morton, Billy Mayerl, George Gershwin, Fats Waller, Art Tatum, Dave Brubeck & others, interspersed with many historical footnotes and anecdotes of the ‘jazz age.’ . Tickets £10 (£2 off for concessions), accompanied children under 16 free, available from Hastings Information Centre (01424) 451111 or Imagen Gallery, 20 Claremont or on the door. Azur at the Marina Pavilion, St. Leonards on sea. Stands cost £20.oo (cheques made payable to Azur) - available for charities, voluntary organisations and third sector /social enterprises. This event will have 3 directives, Fundraising, Volunteer Recruitment and Information Promotion And Awareness. The event will also include live entertainment, charity auction and a raffle. Aannual Minis Festival - over 1200 players from across Sussex from ages 5 through 12 meet in a day-long competition of thrilling and fun rugby. The Hastings net shops have recently been upgraded to grade II* listed buildings because of their architectural uniqueness. Since the 1980s, local historian Steve Peak has played a leading role in saving them, and he owns one, dating from 1835, which he preserves as a museum. Inside is a large collection of original fishing and marine artefacts, many dating from pre-World War Two. The museum is not open very often, but today you can come inside and catch a glimpse of life in the days of sail (but not if it is raining!). Admission free. 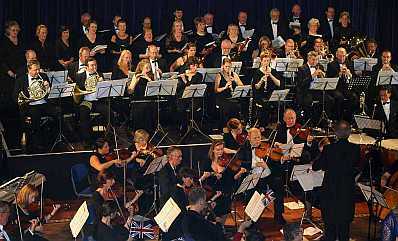 Concert by Sussex Concert Orchestra conducted by Kenneth Roberts. Programme: Mussorgsky ‘Night on the Bare Mountain’, Tchaikovsky ‘Excerpts from Swan Lake’ and Borodin ‘Symphony No. 2’. Tickets £10 (£2 off for concessions), accompanied children under 16 free, available from Hastings Information Centre (01424) 451111 or Imagen Gallery, 20 Claremont or on the door. Take a peek behind the scenes at Hastings's top class entertainment venue and enjoy a sumptuous Afternoon Tea whilst gazing out across the English Channel. Situated opposite the pier on Hastings seafront, the White Rock Theatre is a building steeped in history and theatricality, so why not find out more with this nformative and enjoyable theatre tour. The tour starts at 2pm with Afternoon Tea served at 3pm. White Rock Hotel. This event is aimed at casual chess players (i.e. players who do not have an official chess grade).There will be two sections – one for players of any age and one for junior players under 14 years of age. In each section all players will play five games against different opponents. 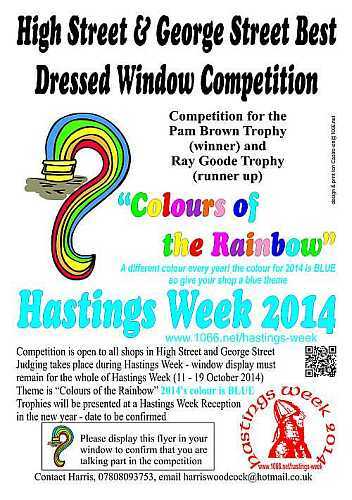 This is the sixth time that this Hastings Week event has been run and it has been greatly enjoyed by the participants. Entry fee: £3 (£2 for juniors). Payable on the night. All entry fees will be used for prizes. Refreshments are provided throughout, with wine and snacks at 6.30pm. The forum is free of charge, but please register in advance at: A.Callaghan2@brighton.ac.uk. The academic contact is Dr Deborah Madden at: D.Madden2@brighton.ac.uk. Join Tina Brown, local author and tour guide for this fascinating journey into Hastings past. Listen as stories are brought to life and legends are told., of ghostly goings on in the ancient quarter. Suitable for all ages. Please contact Tina to secure your place as numbers limited. Tickets available on website www.hauntedexperiences.eu or on the night. Ticket price includes donation to Hastings Week, Fire Face Project and Alta Conservation. Emmaus provides a home and work for formerly homeless people in a supportive, family environment. Residents live on site and work together in our charity superstore, collecting and renovating donated goods to sell in order to support themselves. 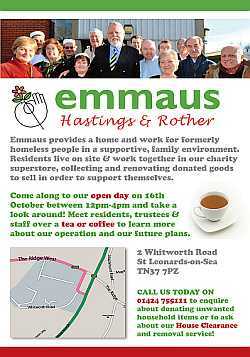 Come along to our open day on 16th October and take a look around! Browse our superstore and meet residents, trustees & staff over a tea or coffee to learn more about our operation and our future plans. Call us on 01424 755111 for more information. See our advertisement for details of our location. Two sections to this competition. Open to all including sight impaired. Write your memories to the theme, Hobbies, Games and pass times. 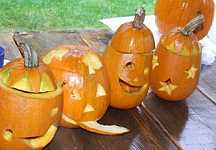 Entries to HRVAB, 3 Upper Maze Hill, St Leonards on Sea, by Monday 8th September . Prize Giving will be in the Taplin Centre, 3 Upper Maze Hill, St Leonards on Sea. Join Tina Brown, creator of the Hastings Old Town Ghost Walk for this fascinating and entertaining talk about the last 21 years she has spent researching and leading the Ghost Walks around Hastings. There have been moments to laugh and some to cry, so share with her these special moments in this birthday year and get a glimpse behind these scenes of this popular tour. 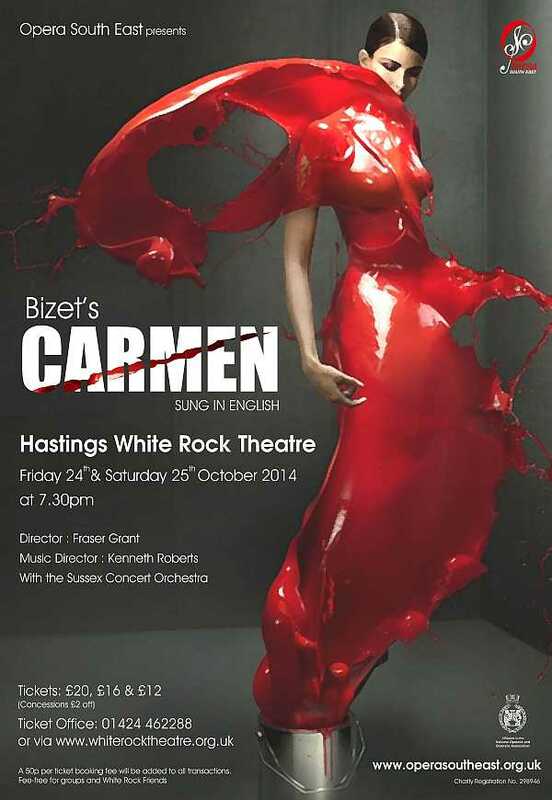 Tickets £7.50 includes donation to Hastings Week, Fire Face Project and Alta Conservation. Gruesome local history featuring true tales of terror from. Old Town's less illustrious, past. Definitely not for the squeamish' May not be suitable for some: children- Route wheelchair accessible. A concert by Waites and Measures at Holy Trinity Church. Music by the ever popular Sussex Brass, supported by the drummer Vincent Salzfas and his exciting group the Ecstatic Republic of Conga, and RoCoCo – Robertsbridge Community Choir - singing songs with an African flavour. 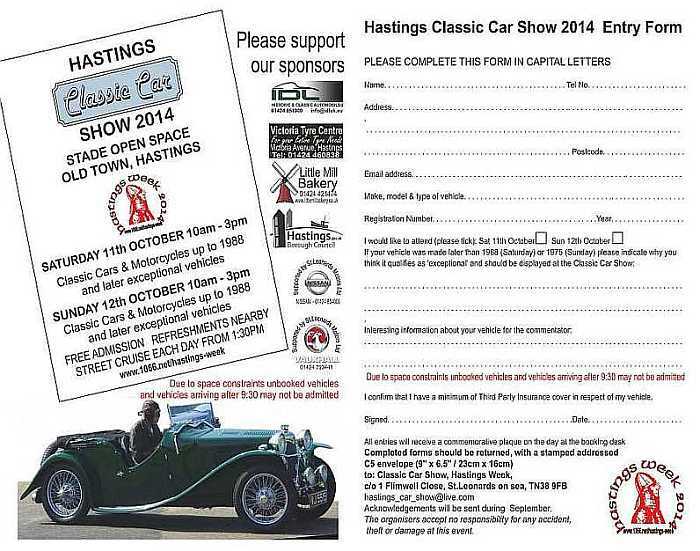 All welcome to join in this popular annual Quiz Night, this year with an added Hastings dimension for Hastings Week! - at the Hastings Centre, The Ridge, Hastings. Tables of 10 (£25 per table) need to be booked in advance by calling 01424 753322. Baldslow Memorial Hall, Harrow Lane, St.Leonards on sea. Hastings Organ Society (01424 426723 evening only). Sacred Heart School, Old London Road, Hastings, The very best of quality crafts on sale. Stalls ranging from knitting/needlework/produce to plants/flower arranging/jewellry, painting, felting and much more – don’t miss out come and see us and bring the children too. Buy early for Christmas! Admission free. Book a stall - download form Here (Word) or Here (pdf) A4 posters can be downloaded here (pdf). SAFE Respite Care are holding a special coffee morning, on Saturday October 18th, in the Day Care Centre, of St.Michaels Hospice, There will be several tables with things for sale. And of course, a Raffle. Priory Meadow. 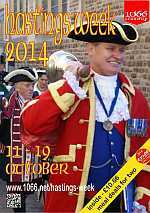 Hosted by our very own Town Crier, Jon Bartholomew. 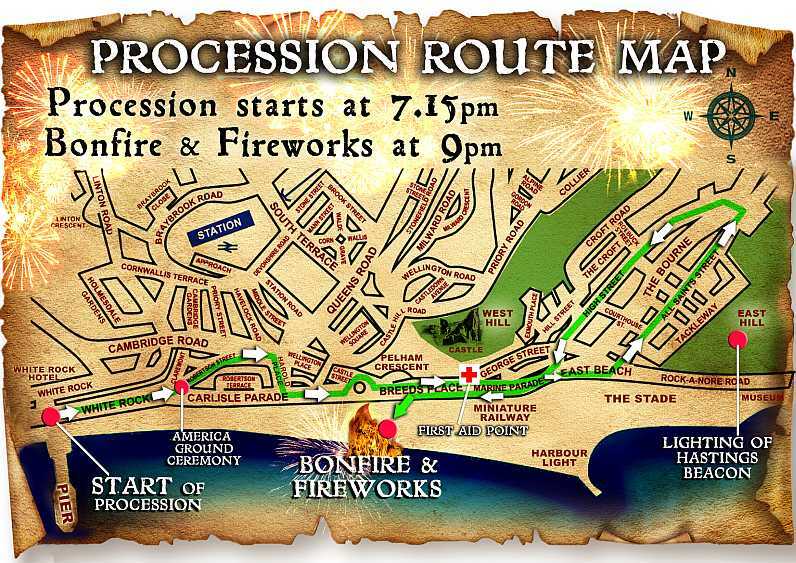 Don't forget to buy your Bonfire Society Programme - all the details of tonight's event and more. It also helps to fund the Bonfire Festivities. Sacred Heart School, Old London Road, Hastings, The very best of quality crafts on sale. Stalls ranging from knitting/needlework/produce to plants/flower arranging/jewellry, painting, felting and much more – don’t miss out come and see us and bring the children too. Buy early for Christmas! Admission free. Book a stall - download form Here (Word) or Here (pdf). A4 posters can be downloaded here (pdf). Tickets £8 on the door or in advance tel. 01424-442601. Organised by St Mary in the Castle Friends. This will be the 6th year that the Sprat and Winkle Run for commercial vehicles has been running from Sevenoaks down to Hastings to bring the Hastings Week celebrations to a close. The run started as an idea by the London & South East Area of the Commercial Vehicle Society who were looking for a seaside destination for one of their old commercial vehicle runs. The Sprat & Winkle Run attracts around 70 different commercials including buses and coaches, and now is a permanent fixture on the preservation scene, so please come along to the Stade to have a good look at the vehicles and feel free to chat to the owners and drivers who have come down to Hastings, we look forward to meeting you. The event is named The Sprat And Winkle Run because the finish is at The Stade, Winkle Island, so we send a load of Sprats to catch the Winkle!! Stade Open Space at the Spratt & Winkle event. Adapted from the novel by Erich Maria Remarque. The film follows a group of German schoolboys, talked into enlisting at the beginning of World War 1 by their teacher. The story is told entirely through the experiences of the young German recruits and highlights the tragedy of war through the eyes of individuals. 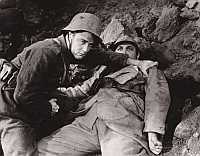 A landmark of American cinema and a highly emotive film, which fixed the popular image of what it was like in the trenches. It still retains its overall power and remains a great pacifist work. Hosted by Paul Sargent, former head curator of the Imperial War Museum Film Archive.